When I saw this paper at the LSS I just fell in love with the rain boots! I had planned on using some of my My Favorite Things stamps with the paper, and I did use the sentiments but I just didn't use the little headless girl holding the umbrella that I had planned. 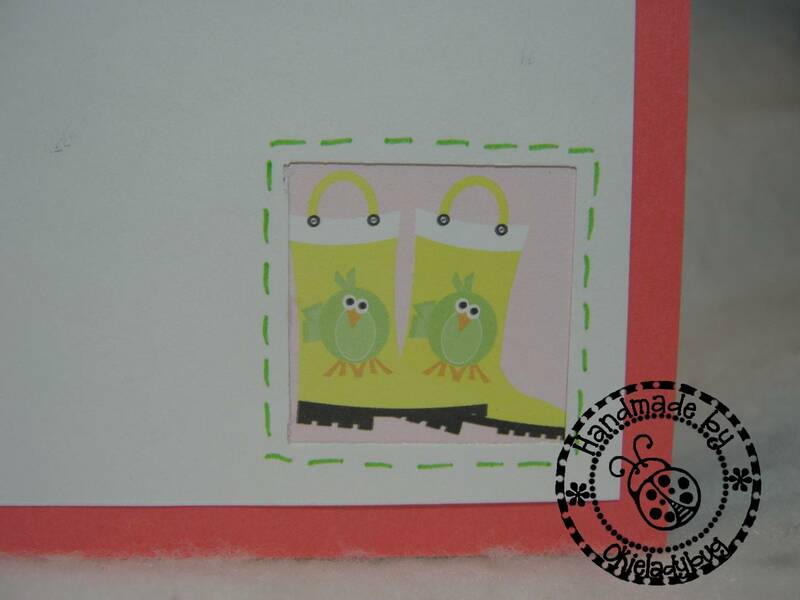 For the inside of the card I used a piece of the left over paper that had rain boots on them and punched out the bottom right hand corner of the card insert and then put the rain boots in the square. It looked a little plain at first but after I added the faux stitching around the square it looked better. 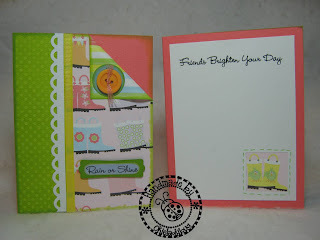 The sentiment on the front and inside of the card is from the "Rain or Shine" My Favorite Things stamp set. Here is a close up of the rain boots in the square. 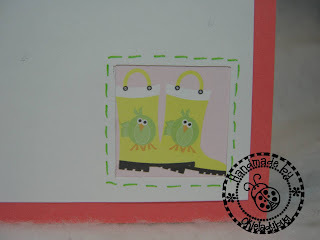 I love the little birds on these rain boots. 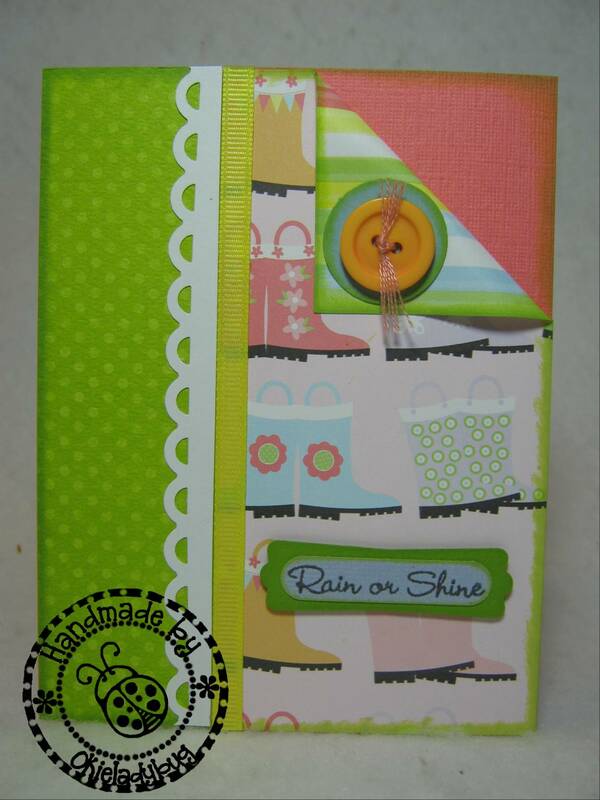 Of course come to think of it I liked all the rain boots on the paper and that is why I bought it in the first place! *okie thinks she is such a dork sometimes*. 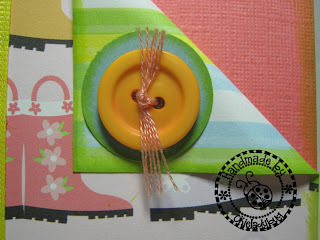 I got the idea about the button with the folded down paper from a card class that Linda and I went to last year in Moore, OK. I think it is a nice way to show off double sided paper. The button didn't show up too well just on the paper so I decided to put a piece of cardstock behind it. Having a good selection of circle stamps comes in handy sometimes! I just used a paper piercer to add the button on the card and then used embroidery floss *okie is slo glad for spell check because she is always misspelling embroidery* to tie the button down. very cute, love the paper and button. 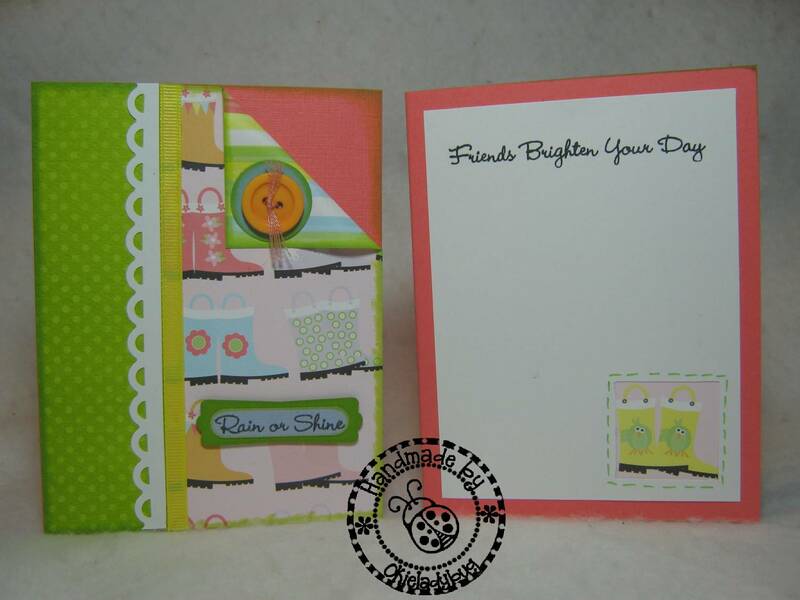 As always you have some creative ideas for card making. Love the fold over with the button. That really added to the card.